Our highly skilled wedding hair and makeup team can come to your wedding day to give you, your bridesmaids and your family the perfect mobile wedding hair and makeup service. featured in this section are the stylists and team members covering Wiltshire, Somerset and the South West. Based in Swindon, Holly is a talented, experienced bridal make-up and wedding hair artist covering Wiltshire and the surrounding areas. Holly started her career after completing a BTEC in media make-up and assisting a celebrity make-up and hair artist which helped her into the make-up and hair industry. 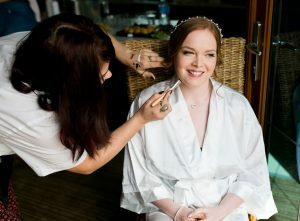 As a freelance make-up and hair artist Holly will carry out your trial in the comfort of your own home and come to your chosen venue to make you look beautiful and feel special on your wedding day. Below is a list of Hair and Makeup stylists based and working in your area. If there’s another stylist you’d like to work with from our team who’s based elsewhere, that’s fine too – we’re often happy to travel to your venue. Just contact us to request a quote or arrange an appointment.